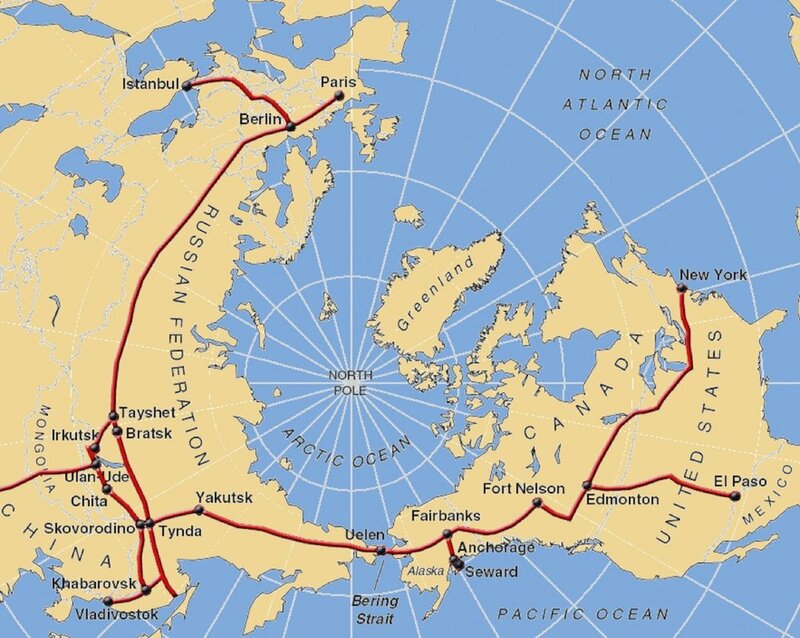 The InterContinental Railway will run from Edmonton, Canada to Harbin, China and will connect North America, Russia and Asia via an 85 km long tunnel beneath the Bering Strait. It will be the Panama Canal of the 21st Century and will transport 3% of the world's freight. The original idea dates back to the 1860s, but technological, geopolitical, and financial challenges thwarted its construction time and time again. In the wake of globalisation and climate change, the InterContinental Railway is picking up steam once again and is more relevant than ever. Join us on our quest to link North America, Russia and Asia across the Bering Strait! Seen from the North Pole, the distances between North America and Asia are much shorter due to the curvature of the earth. This radically reduces transportation time by rail versus shipping time across the Pacific. NASA satellite view of the Bering Strait with Russia to the left and the US (Alaska) to the right. In the middle are the two islands Big Diomede (Russia) and Little Diomede (USA). The International Date Line runs in between.